In this Video Tutorial I will show you how to enable initial access to the ASA device in order to connect with ASDM graphical interface or with SSH. An out-of-the-box Cisco ASA device is not fully ready to be managed by the GUI interface (Adaptive Security Device Manager – ASDM). There is an initial configuration required to enable ASDM access to the firewall. I know the above task in pretty basic but I hope it will help a few people that are just starting out with ASA firewalls. First we need to have console access (with a serial console cable) to the device in order to configure some initial settings to allow user access with ASDM or with SSH. 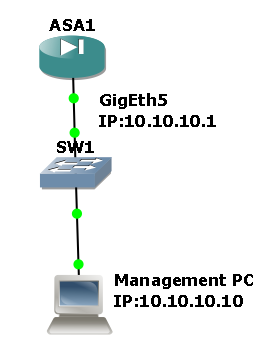 We will configure Interface GigabitEthernet 5 as a management interface with IP address 10.10.10.1/24. Also, on the same subnet we have our management PC with IP address 10.10.10.10/24. The management PC is running also a TFTP server software (tftp32) which will be used to transfer the ASDM image to the ASA.
! Configure IP address to Interface GigEth5 and put a high security level (90 is good).
! Tell the appliance where the asdm image is located.
! Tell the device which IP addresses are allowed to connect for SSH access and from which interface.
! Configure a LOCAL username/password to be used for authentication.